Eureka! An unexpected find! There was one lonely roll of ground lamb lurking at the back of a freezer drawer, camouflaged amidst similar-shaped chubs of pork sausage and some homemade cookie dough. Mmmmmmmmm, we enjoyed juicy, feta-stuffed lamburgers and a Fattoush salad for lunch, but that still left half a pound of ground lamb for another day. In the week’s cold, stormy weather (link) it was an easy decision - Avgolemono Soup. With Lamb Meatballs and an accompanying Greek Salad and pita chips. That meal defied the weather, bringing hints of sunshine into Kumealon Inlet. While it wasn’t a Mediterranean location, I could close my eyes and dream of blue skies and sandy beaches. There must be hundreds, even thousands of Avgolemono recipes online and in print cookbooks, each with slightly varying ingredients and techniques. Go ahead, Google it and see for yourself. Chicken broth thickened with eggs, a handful of rice, lemon juice, and parsley, dill and/or mint are common to most versions. Parsley is a typical garnish. That’s it, a very short list of basic ingredients for the cook. Even the addition of meatballs doesn’t take it beyond ordinary pantry staples. What’s so special about the combination? Somehow the lemony tang, the lamb meatballs, and the custardlike broth work magic together so the resulting soup holds more flavor than you would anticipate. We prefer the warm version, with the added flavor derived from lamb meatballs. 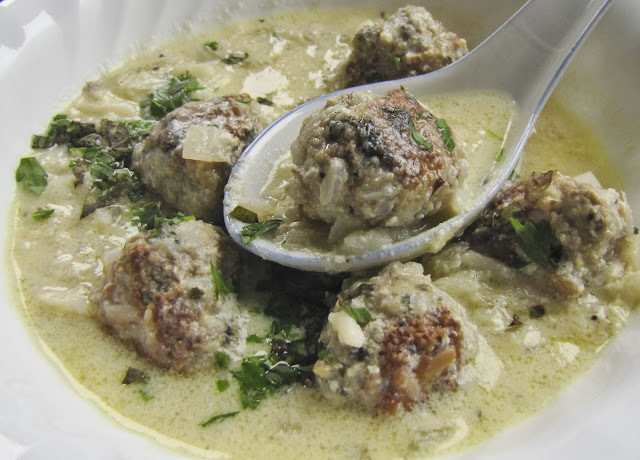 That said, avgolemono is delicious with or without the meatballs, as a sauce or even chilled as a hot-weather soup. This is versatile, tasty comfort food; what more can you ask of simple ingredients? In a bowl, combine meat, onion, rice, breadcrumbs, just 1/4 cup of the parsley, mint or dill, and only 1 of the eggs. Knead with your hands until well mixed. 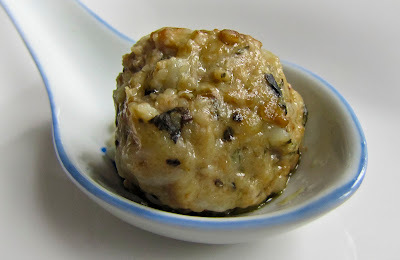 Form the mixture into tiny, 1/2 inch, meatballs. In a bowl, beat the remaining 2 eggs until very frothy. Gradually beat in about 1 1/2 cups of the hot soup, beating constantly to prevent curdling. (This step tempers the eggs so they won't scramble when added to the soup.) Continue to beat until thickened, then slowly stir the egg mixture into the hot soup. Heat through, but do not allow the soup to boil (or it might curdle and separate). Ladle into warmed bowls, sprinkle with remaining 1/4 cup parsley and serve hot. Remember to close your eyes and dream of blue skies and sandy beaches. Warm sunny days, on or near the water, with someone waiting on me... in my dreams. At least these sunny thoughts kept me from frowning at the gray, windy weather outside the galley windows this week. Those same thoughts took me traveling back through some wonderful memories. 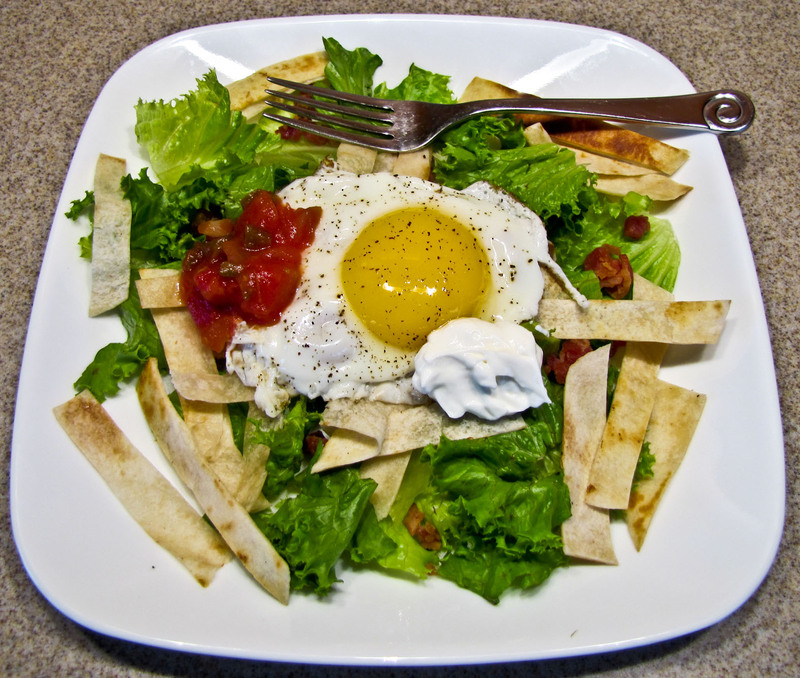 Chilaquiles are a traditional way in Mexican households to use leftover tortillas; end of story, or so I thought. Then I ran across several internet discussion threads debating migas vs chilaquiles as THE decidedly different and authentic use of leftover tortillas. I ran a Google search on "chilaquiles vs migas" and was stunned to see over 2000 hits, and many with conflicting descriptions. Baked casserole or pan-fried mixture? Eggs or eggless? Crispy or soggy tortillas? and on and on. So what do you call a dish with crisped tortilla strips, a red chili sauce, pepper strips, eggs and cheese? I vary my cooking method and ingredient list, depending on whim and dining partners, and still call the dish chilaquiles. That word is just more fun to roll off the tongue than migas. Authenticity aside, here's a tasty way to use up a few corn (or flour) tortillas for a breakfast treat. Pour off all but 1 tablespoon of the oil in the frypan and heat over medium-high heat. Add the onion, garlic and poblano and cook briefly to soften, not brown. Add the green onions, tomatoes and a few tablespoons of that optional chili sauce; stir to mix and cook until the tomatoes begin to give up their juices. Now you have some choices. I like to make four holes in the pan sauce, drop an egg in each hole, cover the pan and cook slowly until the white are set and the yolks are still runny. OR soft-scramble some eggs in the pan sauce or in another pan. OR you could warm up some pre-poached eggs in warm water and use them…. Cook the eggs any way you like!. Scatter the tortilla strips on a plate, cover with eggs, pan sauce, cheese, cilantro and any other toppings and garnish you like. Think of your favorite taco ingredients added to a flavorful broth, and presto! There you have the basics of Taco Soup, just skip the shredded lettuce. There's Beef Taco Soup, Chicken Taco Soup, Whatever's in the Fridge Taco Soup... you get the picture. 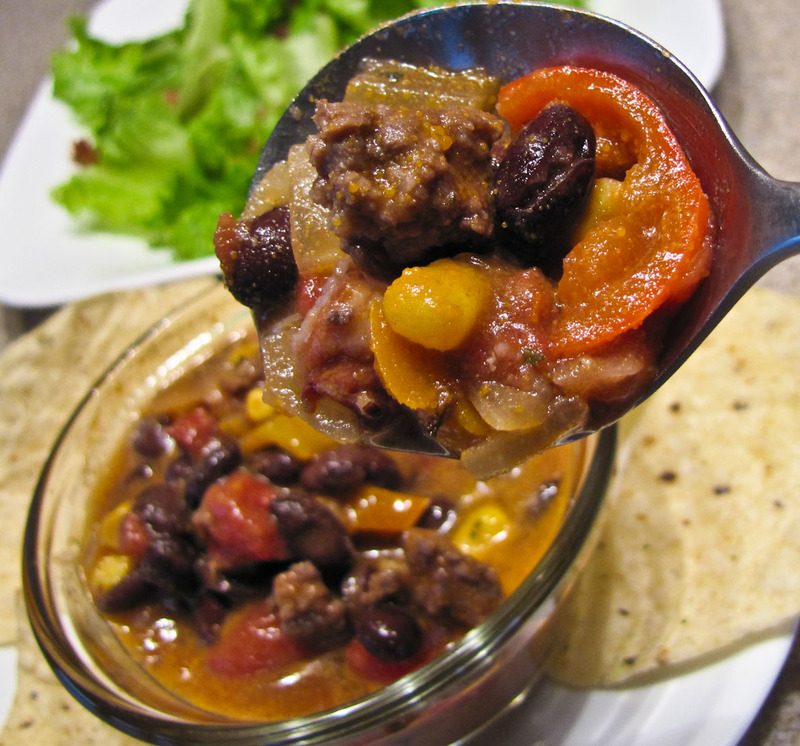 My latest version was more in the style of Keep Messing With It Till You Like It Taco Soup. After three days of messing with it, we really did like it today. Finally. I had created a huge taste challenge by using an unfamiliar brand of jalapeno-flavored canned tomatoes. Oh, oh, oh my! I killed off a few taste buds right there on the spot, just blew those receptors away. Determined not to dump the soup pot, I added some corn, skipped the usual hot sauce, doubled the liquid, and let it rest. Taste Test #1: too fiery, even with a heaping tablespoon of sour cream added to each bowl to temper the heat. On day two I tossed in a very large can of black beans, added a can of diced tomatoes in puree (without any jalapenos) and reheated the pot. 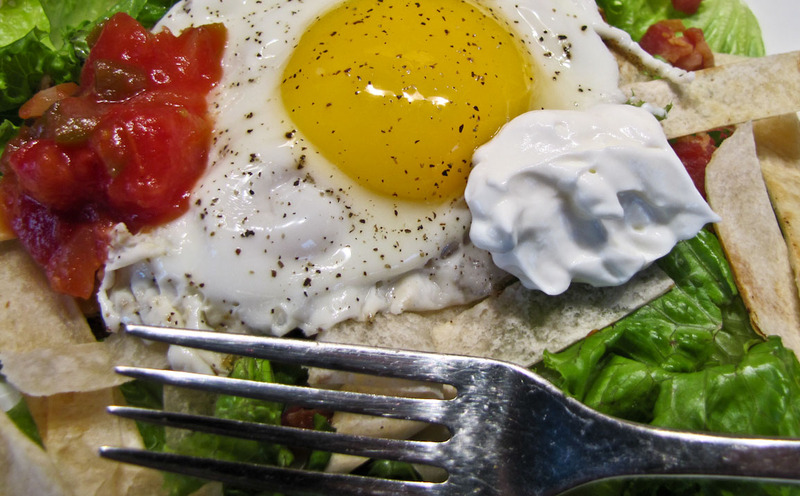 Taste Test #2: we could eat it without tears, but it was still too peppy, even with the added topping of sour cream. On day three I browned 1/2 pound of lean ground beef, added some chicken broth and mixed this into the soup pot. Some chopped sweet peppers joined the party. Served with lime-flavored tortilla chips this finally was a good bowl of soup. Taste Test #3: yummy as is, even without the sour cream. Note to self: To avoid another three-day soup challenge, be sure to check the heat level of unfamiliar ingredients before adding them to the pot. 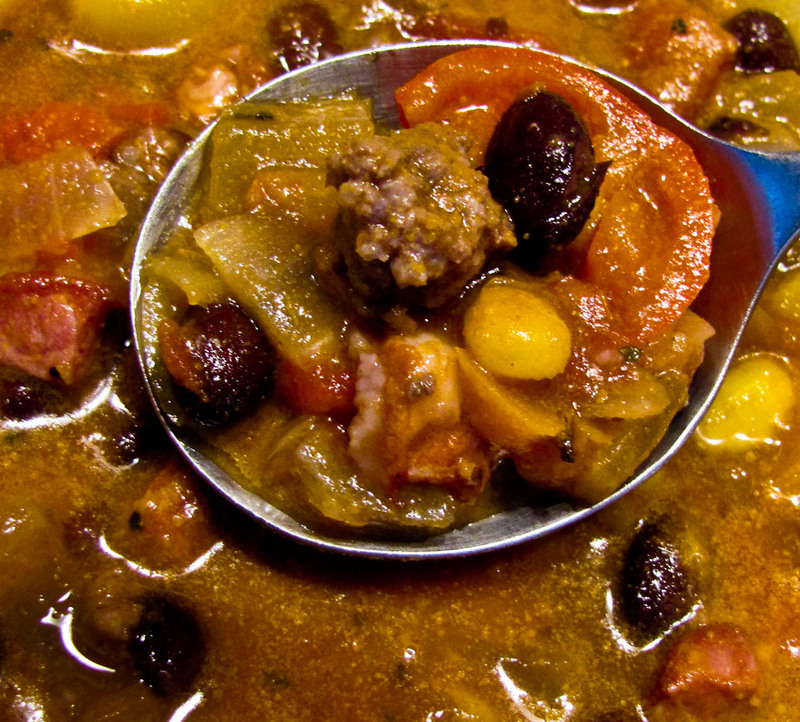 Surprise, this Chicken Taco Soup morphed into Beef and Chicken Taco Soup. Rather than detail my three-day list of ingredients, I'll share a basic recipe I could have followed. Feel free to add your own extra ingredients; frozen corn kernels and beans are recommended. Taco soup should not be difficult, it's a beginning cook's kind of recipe. I no longer refer to a recipe when I make taco soup, but after this week's challenge perhaps I should. In a pan of water, simmer thin coins from 1 or 2 links of a hot sausage, like chorizo, andouille, hot Italian, etc. (optional – you can double the amount of salsa used instead). Cook about 10 min., discard water and grease. This should decrease the fat and tame the spicy heat, but add flavor. In a heavy Dutch oven or soup kettle, heat the oil over medium heat. Add the chopped onion and sauté until soft, about 5 min. Add the garlic and sauté until soft, about 2-3 min longer. Stir in the sausage, cilantro, cumin and oregano. Add salsa (or salsa and tomatoes), reserved chicken cooking broth and 4 cups additional chicken stock or water. Bring to a boil over high heat; reduce the heat to medium and simmer, uncovered, for 10 min to blend the flavors. Add the shredded chicken to the pot. Taste and add salt and pepper as needed. Continue to simmer over medium heat for 3-4 min. (At this point I remove the pan from the burner and let cool. It always tastes better later in the day or especially the next day after the flavors have had time to blend.) Add more chicken broth as needed for consistency, and more salsa as needed for heat. To serve, reheat and ladle into warmed soup bowls. Top with tortilla chips, fresh cilantro, onion, cheese and a spoonful of crema or sour cream. Serve immediately. Note: for a heartier meal, serve with cheese quesadillas. September could be nicknamed Zucchini Abundance Month. It’s a time when colorful little blossoms transform overnight into baseball-bat sized giants. Have you noticed? they’re everywhere! Friends, distant relatives even strangers become overly generous and try to gift you with shopping bags full of this squash. Zucchini recipes pop up in print and online - who knew there could be so many variations on zucchini bread and zucchini casserole? It’s not that we don’t like zucchini. Really. We eat it, though one of us grumbles and greets it with considerably less enthusiasm. Sometimes I grill oiled zucchini halves on the barbecue or in a grill pan. Often I slice the squash into half-inch coins, brown one side briefly in an oiled skillet, then flip them and sprinkle the tops with a bit of grated fresh Parmesan cheese. The second side browns while the cheese melts and the dish is ready to serve. But that's not what this post is about. These are everyday preparations, but nothing to get excited about. Ahhhh, but raw zucchini ribbons are almost a different vegetable. 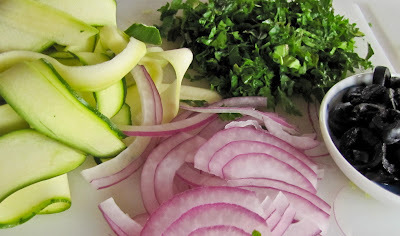 We both enjoyed a raw zucchini salad that Slone prepared onboard last month. I found a similar recipe via epi, my latest iPhone app which links to recipes at epicurious.com. 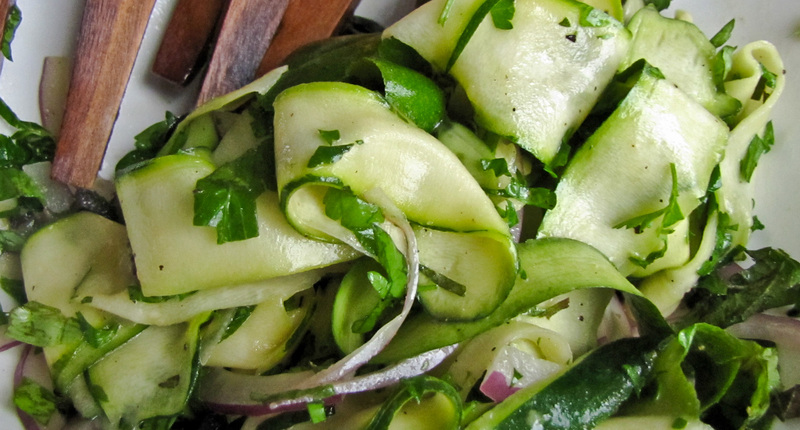 We tried it… we liked it… and we’ll now celebrate Zucchini Abundance Month with an improved attitude. Just don’t leave any of those oversized monsters on my doorstep! 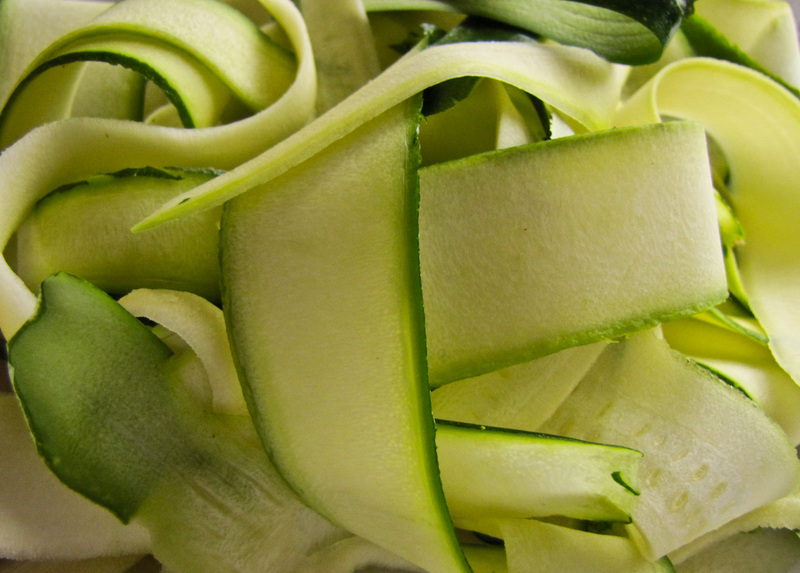 Cut the zucchini lengthwise into very thin (1/8-inch or less) slices using a mandoline or vegetable slicer/peeler (don’t bother with the seedy center core). Transfer to a colander set over a bowl. Sprinkle the zucchini ribbons with salt and toss to coat. Let stand 5 minutes, then rinse under cold running water. Transfer the zucchini ribbons to a clean kitchen towel, spread in a single layer, then gently roll up towel to absorb excess water and let stand 5 minutes more. Whisk together oil, zest, juice, mustard, honey, and pepper in a large bowl until combined. Add zucchini, frisee, herbs, olives and onion and toss to coat. Serve immediately. 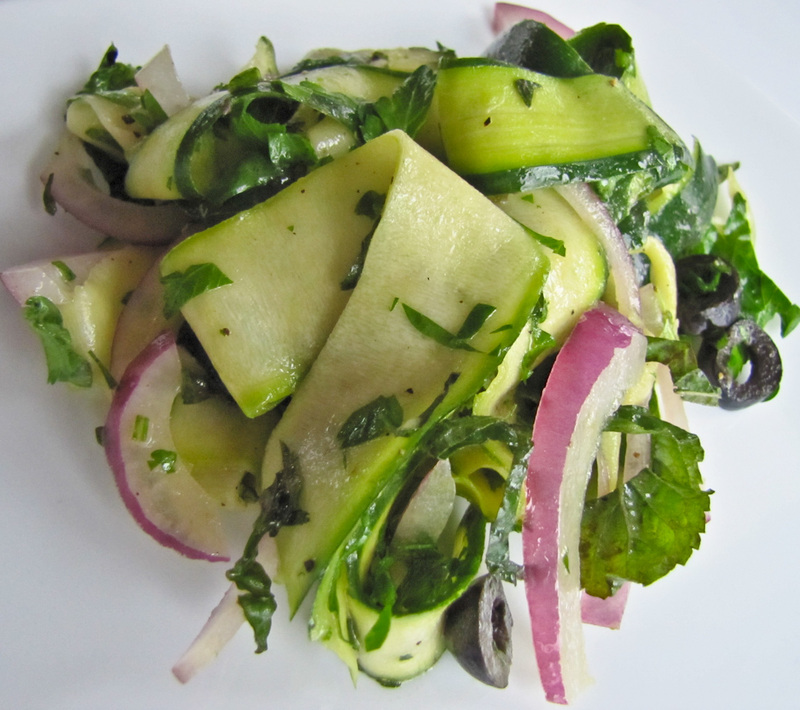 Do a Google search on "zucchini ribbon salad" and you'll be amazed at the number of hits. Everyone from FoodNetwork chefs to half of the blogging world seems to have posted a recipe. I may taste test a few more during September. For a peppy approach to a cool zucchini dish, check out Donna's recipe with jalapeno vinaigrette at EverydaySouthwest (link). 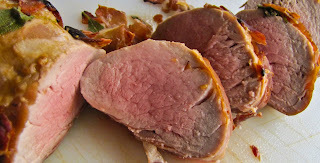 Pork tenderloin is an essential staple in my galley. It is the little black dress of entrees, simple but ready to be dressed up or down with accessories depending on the occasion, the accompaniments and the preparation. That comparison occurred to me as I planned a company dinner with no time to shop and limited provisions on board. There’s always a package of pork tenderloin in my refrigerator or freezer; I just needed to find the right accessories to glam it up a bit. For just the two of us I might slice a few chops off a tenderloin, pound them thin and prepare them piccata-style. When rushed, I’ve cut tenderloin into large chunks and done a quick simmer in a poblano, tomatillo and onion salsa verde. Lemon, garlic and rosemary marinated tenderloins were a hit at an impromptu dock dinner. Mmmm, a quick sear in a cast iron skillet followed by a fast blast in a 450 F oven made magic with that entrée. 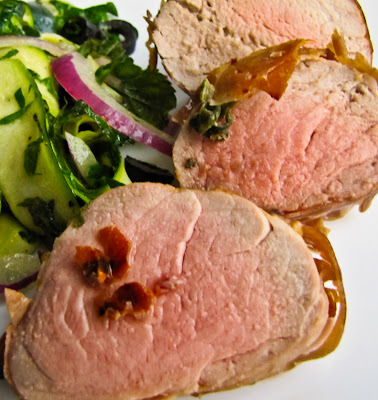 When simply roasted, then finished with a pan sauce, pork tenderloin can be a versatile weeknight entree. But there was no plain pork served that night. Oh no, I found a package of prosciutto in the freezer, just the thing to make the entrée (and the cook) look good. The end-of-the-season herb garden still held some sage, and a tempting assortment of mustards filled a referigerator door rack. Spicy honey mustard would complement the sage flavor and would also serve to hold the prosciutto wrapping in place during cooking. I was ready to rock and roll with a prosciutto-wrapped pork tenderloin. It really was tasty, the four of us ate most of two tenderloin strips. How can a recipe with only four ingredients and minimal hands-on preparation result in such a delicious entrée? The comparison worked - it was similar to adding pearls and heels to the aforementioned little black dress; less is more. 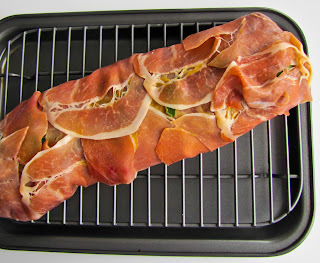 · Preheat the oven to 450 F.
· Spread the prosciutto pieces out on a cutting board, overlapping slightly, forming a base big enough to wrap the pork. · Slather the mustard over the tenderloin; tuck the skinny end under to make a uniform-width log of meat. 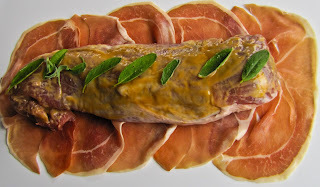 · Place the tenderloin on top of the prosciutto and scatter the sage leaves over the top. 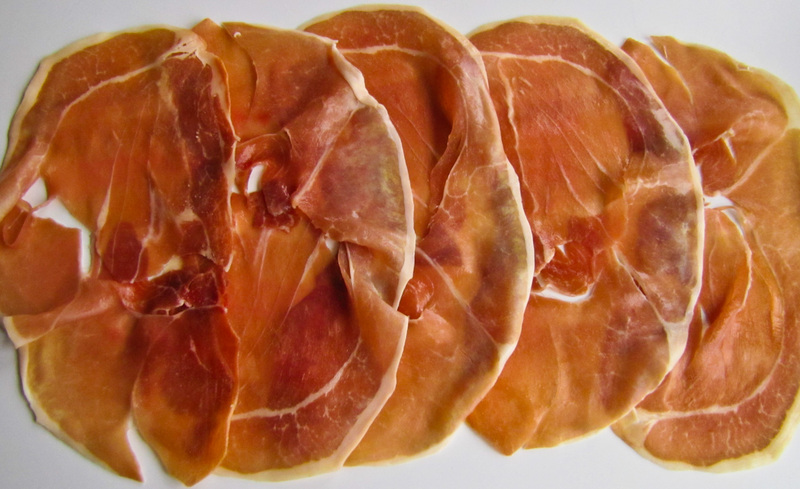 Wrap the prosciutto slices over the tenderloin, tucking the ends in to make a neat package. 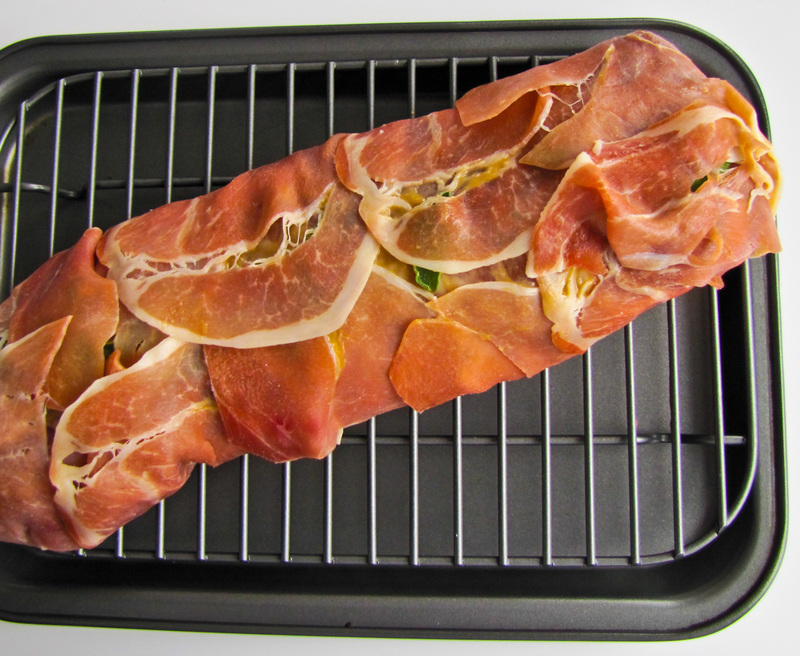 · Place the wrapped meat on a rack inside a shallow pan. Insert a meat thermometer, put the pan in the preheated oven and roast for 10 minutes. · Carefully turn the tenderloin over (to crisp up the bottom) and roast for another 5 to 10 minutes, until the internal temperature reaches 140 degrees. · Remove from the oven and let rest for 5-7 minutes. Slice half-inch pieces and serve immediately. Any leftover tenderloin, thinly sliced, makes an awesome panini when layered with brie, chopped pecans, sliced pear and a bit of chutney. Use a hearty artisan bread, maybe a bit of arugula, toast and you have a dynamite sandwich. It’s reason enough to roast a pork tenderloin!